Hos Dorte: Show Some LOVE, mid-way reminder for HM&FMC. 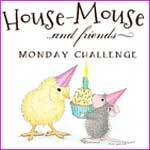 theme at House Mouse & Friends Monday Challenge. using paper from My Mind's Eye, the 'Winter Wonderland' collection. The sentiment is from Magnolia, and the brads are from my stash. The backside is super simple, just like the front. so please hop on over to the HM&FMC and check them all out. Aw, Dorte, never thought about using this image, but it is perfect for the love theme. I love the simple design. Papers look great with the candy canes too. What a lovely image...you made a great card with it! super cute and a beautiful card Dorte. Ho Dot awww these guys are so sweet, clever take on the LOVE chall theme..great DP matches the candy cane..
Lovely Christmas card, those mice are just so cute! 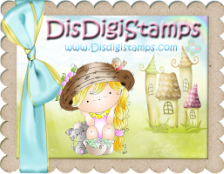 Thanks for joining us for this week's Simon Says Stamp Monday Challenge! 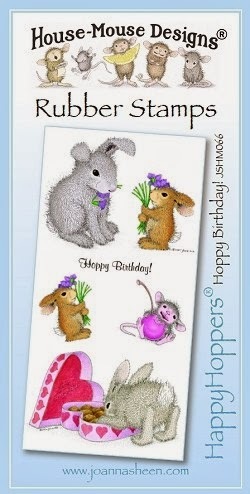 A fabulous card Dot, I love your CAS style and such an adorable image!! Adorable image and card! Thank you for playing along with us at Gruffies & Guests Challenge. and I forgot to say. A delightful CAS card Dorte! Thanks for sharing your project with us - I like the DP you used and the detail of the red Candi. Nicely done. 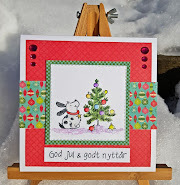 This is a gorgeous card Dorte, I love your clean design and adorable image - a fabulous Christmas card. Perfectly used House-Mouse image for the heart candy to represent LOVE. Beautifully colored. Great Design Teamie. Sweet image and card! Love the background patterned paper, also! Kjempefint kort med søte mus i hjertet. Takk for at du deltar på utfordingen hos My Besties Norge. Håper på å se flere flotte kort fra deg. Shucks, this is so sweet! Thanks for joining us over at AudSentiments this week and hope to see you again soon! Your stamp has made the sweetest Christmas card ever. The papers you've used really give it a proper candy-gram feel. Thanks for visiting me and my mice early. I enjoy the House Mouse challenges.